‘You cannot make an omelette without breaking an egg’ would have been the adage staring in the face of Maithripala Sirisena when he rose at the New Town Hall meeting last November 21st to announce his intention to contest the presidential election and vowed to the nation that he would usher in a new maithri era and root out all the junk in the Rajapaksa trunk in order to do so. 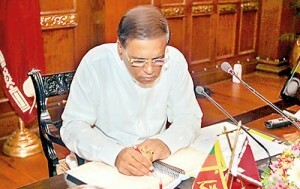 Prefacing his political bombshell with a quotation from the Dhammapada that emphasised that revenge was not his mission, he declared that he had come forward from the ministerial ranks of the ruling party to take on the challenge of toppling the then invincible Mahinda Rajapaksa from his monarchical pedestal, to end rampant corruption, to bring the perfidious rogues to justice, to restore law and order, to offer good governance with greater transparency; and to be the harbinger of a resplendent dawn where old cherished values of fairness, equality and justice dance in the rays of the sunlit morn. SIGNING THE CODE OF NOMINATION: Party leaders and party secretaries rushed to embrace and sign the PAFFREL sponsored March 12th Declaration which laid 8 guidelines, including the one not to give nominations to those tainted with corruption, for political parties to adhere to when granting nomination for general elections. At a high profile ceremony held at the BMICH on March 12th this year, Ranil Wickremesinghe of the UNP, Nimal Siripala of the SLFP, Ven. Athureliye Rathana Thera and other leaders signed the document pledging their adherence to the code. Raising the hopes of millions that at long last a new David had arrived to slay the Goliath, he had declared, “Thuggery, embezzlement, crime, drug mafia, nepotism and corruption have institutionalised under the Executive. The entire socioeconomic and political systems of this country have been taken over by one family. They have ruined this country that is now engulfed in corruption and blatant abuse of power. It is against this that I am coming forward as the common candidate of the opposition”. But the thugs were in the SLFP barracks, the rogues were in the SLFP cave, the druggies were in the SLFP den and the nepotists were in the SLFP family. Reality demanded, common sense dictated that no new civilised era based on democratic values of the sort Maithripala promised to usher would ever see the light of day without turning to rubble the said institutionalised scourge of our times and evicting its squatters, banishing them far beyond the pale of return. Maithripala Sirisena would have known then, even he should know now, that he could not and cannot usher in his promised dawn for a new Lanka without first cleaning his party stables or make a spiffy Lankan omelette without cracking the rotten SLFP eggshell. The SLFP as one of the two major parties plays a vital role in perpetuating democracy in Lanka. Without it as a major force, Lanka would descend to a one party state and dictatorial government would be a one small step away. But to be of any value, it must be peopled with honesty, aired with decency and characterised by national patriotism devoid of racial bigotry. It must not be one turned to a bordello of pimps and scoundrels willing to prostitute the country for personal monetary gain. On January 9, with Maithripala Sirisena’s victory, the nation stood poised adorned with the opportunity to change the culture of corruption that had swamped both the UNP and the SLFP during the last forty years or more. The chance to raise the new standard after scrubbing the deck clean had finally arrived. That was the challenge that awaited Maithripala Sirisena that historic November afternoon at the New Town Hall, a challenge he bravely accepted and faithfully pledged to triumph. Entrenched as the SLPF was in a mass mire of corruption, it would require a complete clean up, a complete overhaul, not a mere mopping up op or a patch up job. It would call for a dramatic change and lead to a temporary split in the SLFP. That was the price demanded of the party to atone for the party members’ manifest sin of having used the party as a convenient vessel to plunder the state; the sacrifice the rest would have to make for meekly standing by. But it would also be the opportunity to infuse fresh blood into the party, blood not tainted or infected with the corruption bug. If the party were to lose the present election as a result of this vital shake up, then, in the long-term interest of both party and the country, so be it. The beautiful butterfly that will take wing from the metamorphosis would justify the sacrifice and be worth the wait for the next time round. The revamping of the SLFP and the possible defeat at the August elections were the price that Maithripala would have to pay to deliver his promised goods to the people. But, at the eleventh hour, just when the nation thought he had withstood the test of his true mettle, he buckled. Not only did he allow the UPFA nomination of Mahinda Rajapaksa to go through but he let the whole roguish brood to break through the open flood gates. As the Ven. Malwatte Mahanayake Thera observed on Thursday to a visiting UNP Western Provincial Councillor as shown on TV news, “So, we are going to have the same nadaya back”. Rajapaksa nomination to contest the forthcoming elections under the UPFA banner. News followed soon that this privilege would also be extended to other pro-Rajapaksa rebels. The whole jingbang was back. The ‘rainbow revolution’ had suddenly fled from the blue skies yonder. Did the 6,217,162 army of voters who had cast their ballot for Maithri primarily to see the last of the Rajapaksas, do so to see instead their jubilant return in just 180 days? Why had the President thrown down his towel and surrendered at the mere whiff of trouble at the gates? Had he, when he first made his promise to wipe out corruption from his own party, bitten off the betel more than he could chew? Was it the people’s winning votes, all 6,217,162 of them, that now lay in the dustbin like soiled toilet tissues whilst the rogues had been taken out, dusted and freshened and perfumed talced and given pride of place in the political rankings? For the rank and file of the United National Party who had walked the streets campaigning for Maithripala in circumstances fraught with danger, who risked their lives in the face of the Rajapaksa supporters ‘wrath even as a UNP party worker lost his life when he was shot dead while trying to erect a stage for a Maithripala rally in Kahawatte on January 5th, it was more than a disappointment, it was tantamount to a loss of faith. For a constituent member of the opposition parties that had made Maithripala the opposition’s “Common Candidate” with so much hope and promise, the Jathika Hela Urumaya immediately broke ranks with both the UPFA and the UNP and declared that it too would contest the forthcoming elections together with a broad coalition front it intended to form. JHU spokesperson Nishantha Sri Warnasinghe stated that those who had exercised their franchise at the January 8 presidential poll never expected that to happen. The President’s decision whatever the reasons which compelled him to accept Mahinda Rajapaksa was contrary to the January 8 mandate. The monk who played a pivotal role in Maithripala’s victory and who can justly claim to be the architect of his ascendency to the presidency, the Ven Maduluwawe Sobitha Thera said he was “thoroughly disillusioned about the current political trends. The expected ‘change’ following the defeat of the former President did not happen.” The dejected monk who had fought for an all-round positive social and political change also expressed his disappointment over the failure of some political parties to nominate candidates with a clean slate. No one really knows what prompted Maithripala to bend the knee to the rogue rebellion. But by relenting to their demands, by retreating instead of standing his ground he has created the image of being an easy ‘pushover’ than as a strong leader committed to even perish for his principles and solemn word. It maybe that this is but a strategic retreat but for the moment at, least, he has alienated the friends he had in the UNP, the JVP, the JHU and in civil society movements. On the other hand neither has his endorsement of the UPFA ‘undesirable’ list endeared him to those Rajapaksa rebels. They have smelled blood and it will only increase their appetite to devour Maithri whole. The entire exercise has served only to isolate Maithripala more. Forfeiting his friends and fomenting the power lust of his enemies even more. On March 12 this year, the election watchdog People’s Action for Free and Fair Elections (PAFFREL) launched a Code of Nominations to be followed by all political parties when considering granting nominations to potential candidates at all future elections. The need for such a code had become vital considering the unsavoury elements allowed to grace the nation’s political firmament. Though the country had free and fair elections, the people’s freedom to elect suitable representatives were limited to the men and women each political party chose to list in their nomination papers. The purpose of it was to ensure ‘clean’ politics by nipping in the bud known bad apples. The declaration was formulated by PAFFREL in collaboration with various professional and civil society organisations, religious, educational and business personalities, public representatives and trade unions. This timely document titled the ‘March 12th Declaration ‘was launched by PAFFREL at the BMICH and was embraced and signed by the leaders and general secretaries of all the main political parties, including President Sirisena who signed it at the presidential office as the president of the SLFP on the 19th of last month. Somewhere down the line, the noble declaration seems to have been thrown aboard, flung to the winds of expediency. On Wednesday, gloating in glee at their victory in forcing the President’s hand, SLFP Secretary Yapa insisted that it would be unfair to deprive anyone of nominations on the basis of mere allegations. But these are not mere allegations but some downright condemnation has come from Mahinda Rajapaksa himself. On Friday, UNP State Minister Rosy Senanayake challenged the former president to reveal the names of those members he had safeguarded. But it is evident that the Rajapaksa has not learnt from his mistake since he still keeps the jolly company of the same gang, having ridden on their back, on the support they displayed, on the rallies they held clamouring for his comeback, to force Maithripala to grant him UPFA nomination. For that matter, neither, it seems, has Maithripala Sirisena learnt from the mistake Mahinda Rajapaksa has confessed he made but not learnt from. He too has failed to banish them from his party and may, if UPFA wins, probably have them in the bosom of his government. Since the announcement was made last Friday that he had endorsed the nomination of Rajapaksa and his rebels, President Maithripala has not issued any official statement on his 180 degree turn on his earlier pledge to the nation. He should do so forthwith and explain to the people what exactly made him put his party before his country.